"Daniel Edward West, Westbrook College, Class of 1976"
Westbrook College student Daniel Edward West, Class of 1976, was a Medical Technology major and a Day Hop. 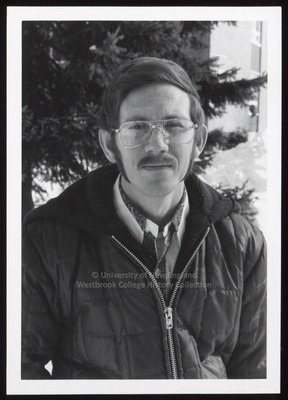 For his senior class candid photo, which appeared in the 1976 Tower Yearbook, Dan wore a dark, quilted, winter jacket with zipper and an open-collar shirt. Long sideburns, a mustache and aviatar glasses outline his face.